With the super speed USB 3.0, you can now transfer data at up to 10 times the speeds of the older USB 2.0/1.1 standards!That's fast enough to transfer a full HD movie in just seconds! You can connect 3 of your USB devices at one time, such as keyboards, mice, digital camera, smartphone, USB flash drive, external HDD ect. Designed to work with the latest generation of computers and smart devices that have USB-C ports, easily switch between USB Type-A and Type-C connector freely. MacBook, making a USB Hub not only a hub, but a beautiful sight. *1.With the super speed USB 3.0, you can now transfer data at up to 10 times the speeds of the older USB 2.0/1.1 standards!That's fast enough to transfer a full HD movie in just seconds! 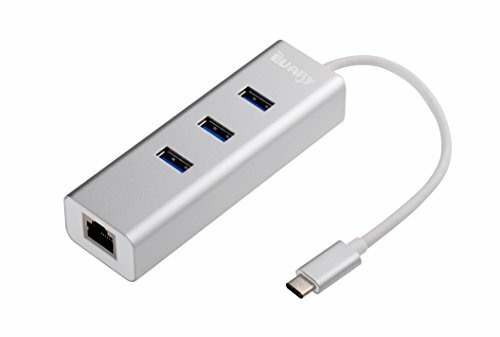 *2.The multifunctional Type C hub contains 3 USB 3.0 ports, works with the latest computers and smart devices with USB-C ports. *4.High speed ethernet. Gigabit ethernet port provides access to super fast network speeds. Installer patch provided for Mac OS. *5.Has over-current protection built into each port to protect both connected devices and your hub from power surges. If you have any questions about this product by Evary, contact us by completing and submitting the form below. If you are looking for a specif part number, please include it with your message.